The summit of Mount Everest. 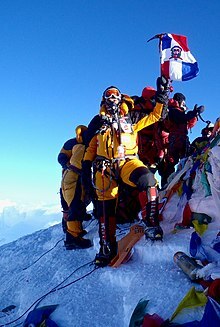 The summit is 8,800 metres high (29,000 ft). The summit is the top of a mountain or hill. In geography, the elevation of mountains is measured. The elevation is the difference in height between sea level and the top of a mountain or hill. A peak is a pointed mountain, though not always. This page was last changed on 13 August 2016, at 16:15.